I'm love it or hate it when it comes to mushrooms, but this recipe was surprisingly good. Portobellos are one of the mushroom varieties that I can stand: thick and juicy, earthy and hearty, almost meat-like. These caps are brushed with a balsamic-olive oil mix; filled with bell peppers, capers, and garlic; and grilled until tender. Capers are another food I never really liked: their salty, tangy, and briny flavor was just too much...but here, they added a perfect burst of flavor that complemented the earthiness of the mushroom. My George Foreman had these ready in about 5 minutes, and you want to grill them long enough to get some charring on the edges. Top with parsley and cheese (I used Parmesan), drizzle with the balsamic juices that will run off, and serve hot. 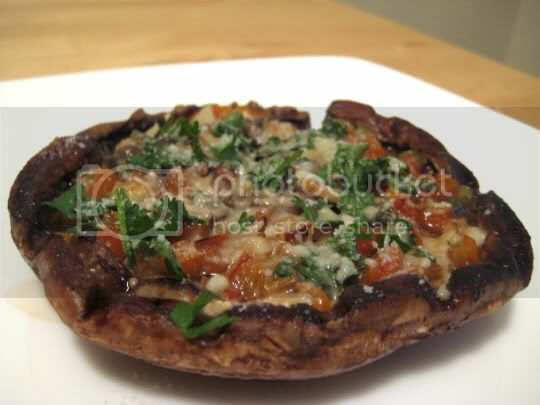 I would suggest seasoning the portobello with some salt and pepper before adding everything else, as the flavor of the actual mushroom was just a little plain. Make again? Yes...mmm I'm actually looking forward to trying capers again.